Finger and toe nails: These integumentary system structures protect the tips of the fingers and the toes. Nail plate: The hard, strong and somewhat bendable surface of the nail and the part of the nail that is made of keratin. Cuticles: Dead skin cells that are pushed over the peripheries of the nails at their base and around the edges. Nail matrix: The tissue below the surface of the nail that is protected by its nail plate. Lunula: The half-moon (luna) white area at the base of the nail. Sweat glands: As eccrine glands, sweat glands are found across the body and they secrete a substance that cools the body off with perspiration and they also eliminate some bodily wastes. The integumentary system consists of the skin, hair finger nails and toe nails and other structures including glands. Unlike the other bodily systems throughout the body, the integumentary system is not localized to one area or region of the body; instead the integumentary system covers the entire body. The skin is by far the largest and most vast organ of the entire body. The protection of the body against the external environment. The skin is, for example, the first line of defense against germs and infections that are in the external environment outside of the body. Temperature regulation. The skin, its thickness and its components, such as sweat glands, maintain the bodily temperature with little variation when the heat and cold of the environmental temperatures come in contact with it. The maintenance of bodily temperature is called thermoregulation. The elimination of wastes through the pores with the process of perspiration, for example. The skin is the body's first line of defense against the threats in the environment that are external to the body. The epidermis is avascular, which is defined as without blood vessels; the skin is comprised of squamous epithelial cells with the main type of cell being a cell that contains keratin which plays a role in the protection of the body and also prevents the skin from becoming water logged. The dermis, the middle layer of the skin, contains blood vessels and it has two sublayers which are the reticular and papillary sublayers, both of which gives the skin its elasticity and its ability to stretch, such as occurs when there is swelling under the skin and when the abdominal area skin stretches during pregnancy. The hypodermis, which is also referred to as the subcutaneous layer, is the fat storage layer of the skin. These fats, which are stored in the hypodermis, are ready for use and ready for the transport of this to cells when this energy is needed. This layer of skin with fat also maintains bodily temperature by serving as an insulator of the body. 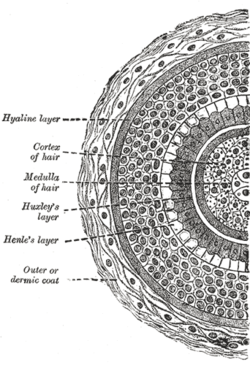 Cross section of a hair. Hair, like the fur of animals, plays a role in keeping the body warm. Additionally, the hair of the eye lashes protects the eyes from foreign debris getting into the eye from the external environment. Hair covers the majority of the body surface; thick hair is found on the head and fine hair is found on other parts of the body such as the pubic area. 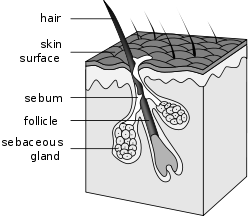 Hair, as shown in the picture above, has a follicle, which is the part of the hair that is below the skin, and a shaft, which is the part of the hair that is above the skin. Hair, like skin and nails, contains keratin. The finger nails and toe nails of the body are also made of keratin like the hair and the skin. 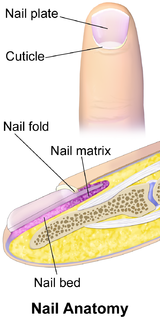 The three parts of the nail, as shown in the picture above, are the nail bed, the nail matrix and the nail plate. The fingernails and toenails protect the tips of our digits (finger tips and the tips of the toes) form injury. The nail plate is the part of the nail that we typically refer to as a "nail"; however, technically, the nail plate is only one of several parts of the nail. The nail plate is the hard, strong and somewhat bendable surface of the nail and the part of the nail that is made of keratin. The nail plate makes up the majority of the nail that is seen with the naked eye. The cuticles are dead skin cells that are pushed over the peripheries of the nails at their base and around the edges. Cuticles are removed during nail care and a manicure. The nail sinus is the base of the nail under the skin where the new nail tissue emerges from. The nail matrix is the tissue below the surface of the nail that is protected by its nail plate. This part of the nail, the nail matrix, will continue to grow infinitely until its nutrition and its blood supply are no longer adequate. The nail bed is skin that has three layers like other skin. This skin is found below the entire nail plate. The lunula, as the name suggests, is the half-moon (luna) white area at the base of the nail. 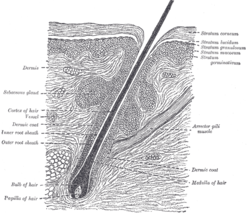 Schematic view of hair follicle and sebaceous gland. Sebaceous glands, are exocrine glands, as contrasted to endocrine glands. 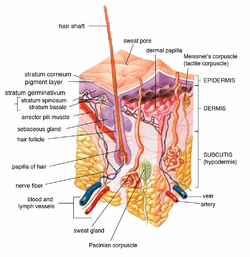 Sebaceous glands lubricate and moisturize the skin with an oily secretion which is called sebum and the sebaceous glands also play minor roles in the thermoregulation of the body and its protective role that armors us against the invasion of infections because sebum is acidic and not an environment that germs thrive in. The majority of sebaceous glands anatomically lie in the face and head, although sebaceous glands are found in all body surface areas which the exception of the palms and sole of the feet. Sweat glands are eccrine and apocrine glands that secrete sweat to the surface of the skin. Sweat glands, as apocrine glands, are found under the arms in the axillar area; they perform little function among humans. On the other hand, sweat glands, as eccrine glands and found across the body secrete a substance that cools the body off with perspiration and they eliminate some bodily wastes. Perspiration is a response to heat and stress and perspiration is a cooling off mechanism.